Our goal at Tuffo, is to continuously develop a line of non-technical outdoor and recreational products. Our products are geared towards the outdoor enthusiast who is looking for a quality product at a reasonable price. By utilizing durable materials and quality manufacturing techniques, we guarantee many years of enjoyment from our products. - Lightweight and compact for convenient storage and traveling. - Includes a carrying bag with large storage pockets. - Rugged, durable water-resistant nylon backing. - Interior polyester batting provides cushioning. - Machine wash cold and tumble dry low / line dry. · Adjustable dividers keep things neatly organized. · Handy pockets on each side allows for extra storage. · Removable, reinforced lid is sturdy enough to draw or play on. · Flip-up sides keep crayons, toys and even food from sliding off. · Made with a durable, easy cleaning nylon fabric. · Secures to seat belt and releases easily when you’re on the go. · A handy, adjustable carry strap makes it easy to transport to and from the car. We have had a small taste of warm Spring weather in the Northeast part of the country over the past couple of weeks (WOW, it's been a LONG cold Winter) which has us all, very excited! With the inevitable warm climates that are sure to arrive within the next couple of weeks, we are preparing for our outdoor adventures and family summer getaways, with great enthusiasm! We love to have backyard picnics and picnics at the park, and the Tuffo Water Resistant Blanket is the perfect accessory for our outdoor dining! With a water resistant back, dew on the grass or slight moisture on the lawn will not dampen your picnic's or playtme this summer. 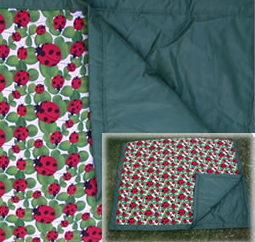 The fabric top is super comfortable, and equally fashionable The Tuffo Blanket that we received has the sweetest ladybug pattern that the kids just LOVE ( also available in several additional patterns pictured above)! We won't have a messy issue getting to where we're going this year either, with the Tuffo Family Car Organizer keeping everything in order! This organizer is just what the doctor ordered with two little ones traveling in the backseat! It allows them to keep all of their toys, books, activities, snacks, and drinks ALL TOGETHER in one handy space (the lid also doubles as a lap desk for little ones to color etc. while on the go). I can't tell you how incredibly messy our van can get when we're on a road trip, with snack containers and drinks dropped, and toys (inevitably) EVERYWHERE! 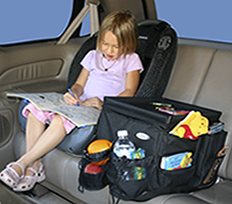 The Tuffo Family Car organizer has brought a calm order back to our vehicle, and the kids remain happy with all of their goodies in one space that they can easily access while we're on the road! Tuffo: Geared for Families On-The-Go! Where will your family adventures take you this Summer? and online at http://www.tuffo.com/ .